Proof that the modern Germans descended from ancient Assyria. In the last century, Germany lost two world wars, was occupied, divided for 45 years and repressed under communism. Yet it has managed to return again as the dominant power of Europe and even as a leading global power. Even more remarkable than Germany’s recovery, though, is that it was being prophesied about even while Germany still smoldered in its ashes over 70 years ago. Such accurate predictions are possible because they are based on Bible prophecy. Bible prophecy covers the most significant and powerful nations and empires in history, and that includes ancient and modern Germany. However, Germany’s identity has remained largely unknown because the modern name is not the one used in the prophecies. Only when Germany’s biblical identity is revealed can one understand these prophecies and comprehend the role Germany will play on the international scene. The key to understanding biblical prophecy is to know the prophetic identity of the world’s great powers. And the identity of Germany is—after that of the American and British people—the most important to recognize! A united, revived Germany as the powerhouse behind Europe is once again dominating world affairs. It is a position Germany historically has enjoyed with few exceptions for the past 1,500 years. And it is a position that the Bible reveals will be wielded to devastating effect in the near future. 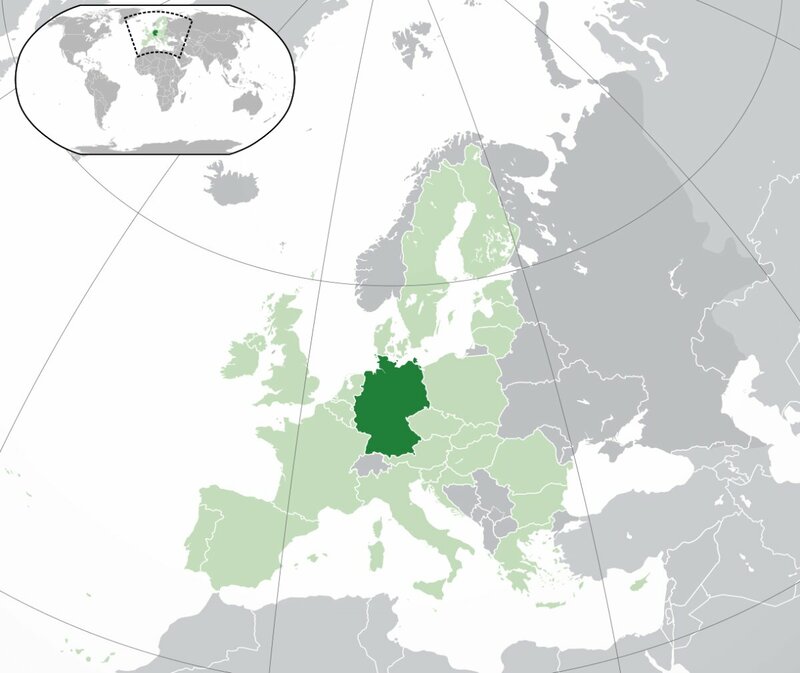 Just who are the German peoples, and where did they come from? The Bible, the foundation of all knowledge, records that mankind first settled just north of Mesopotamia after the Flood. From there, tribes of people migrated to their current locations, where they formed our modern nations. As they migrated, various tribes often became identified by their locations of settlement rather than the name of their tribal patriarch, as they are in the Bible. Tracking the origins of the German people means identifying the ancestor from whom they sprang. By traveling back in time through the works of ancient scholars and archaeological data, we can tell the full story of the German peoples’ migration from Mesopotamia—home of their patriarch Asshur, the father of the Assyrians—to their location today! Even the German people—before the 1900s, when they rejected the history not only of the Bible but also of their own chronicles—demonstrate in their own records that they descend from Asshur! 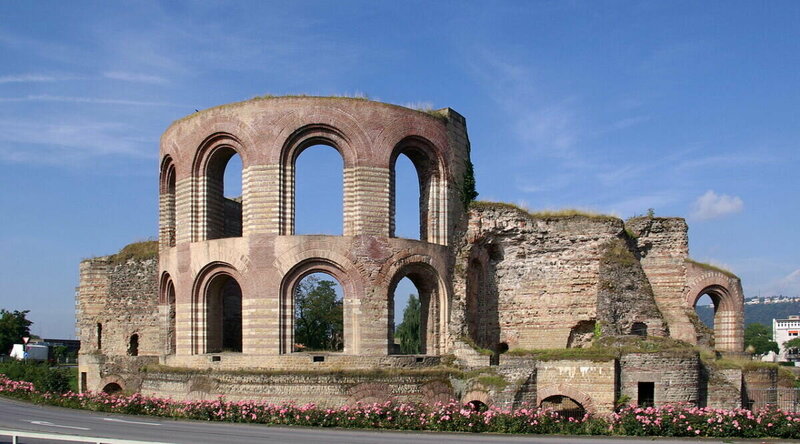 The oldest city in Germany is Trier, a city whose inhabitants say was founded around 2000 b.c by the Assyrians. Josef K. L. Bihl writes in his German textbook In Deutschen Landen, “Trier was founded by Trebeta, a son of the famous Assyrian King Ninus. In fact, one finds … in Trier the inscription reading, ‘Trier existed for 1,300 years before Rome was rebuilt.’” To this day, this story is used to attract tourists to Trier. According to Greek historians, the ancient Assyrian capital of Nineveh was built by Ninus. The biblical account tells us that the builder of Nineveh was Asshur, the son of Shem, who became the progenitor of the Assyrians (Genesis 10:11). Ninus is simply the Greek name for the Asshur of the Bible. The original Ninus was Nimrod, grandson of Ham, of the black race. Asshur, son of Shem, who was white, also took the name Ninus. He is the Ninus ii of ancient historic record who founded Nineveh. While ancient German records—such as the Bayerische Chronik, the official history of Bavaria written by Johannes Turmair of Abensberg in the 1500s, but now relegated to pure myth—reveal that some of Asshur’s descendants settled in Europe from Mesopotamia soon after the Flood, the great majority of the German people didn’t begin their migration until a much later time, when their Assyrian Empire declined and collapsed in the seventh century b.c. Let’s now track the migratory route of these remaining Germanic peoples and see how and when they joined their Assyrian kinsmen in the land of modern Germany. Anciently, the Assyrian Empire and its allies were originally located in Mesopotamia on the Upper Tigris River. The Assyrians were renowned warriors whose empire was built on perpetual warfare. Their empire stretched north from Mesopotamia all the way to Asia Minor to reach the shores of the Black Sea. The Assyrians were a white race whose fair features made them stand out from the other people in the Middle East. Strabo, a first-century Greek geographer, noted their fair complexion, calling the Assyrians “White Syrians” (Geography). Paphlagonia and Pontus both border the southern shores of the Black Sea. The land between was called Cappadocia by Herodotus, a Greek historian of the fifth century b.c., who also confirmed the existence of its Assyrian occupants in his work titled The Histories: ”The Cappadocians are known to the Greeks by the name Syrians …. This people, whom the Greeks call Syrians, are called Assyrians by the barbarians.” By the fifth century b.c., the Assyrians were so dominant in the Black Sea area that Greek geographers actually called the region Assyria! “The coast of the Euxine [the Black Sea] … was called Assyria by S[c]ylax, the author of Periplus” (History of Art in Sardinia, Judaea, Syria, and Asia Minor, Volume ii). The Periplus of Scylax is considered by most scholars to have been compiled in the fourth century b.c., but it was based on source material from the fifth and sixth centuries b.c., when the Assyrians began migrating into the Black Sea area (Itineraria Phoenicia). By the fifth century B.C., the Assyrians were so dominant in the Black Sea area that Greek geographers actually called the region Assyria! Years later, the Assyrians were still off the shores of the Black Sea when Herodotus recorded them fighting for the Persian King Xerxes i against the Greeks in a campaign in 480 b.c. (op. cit.). Archaeological data reveals that shortly after Xerxes’s disastrous campaign, a great migration of the Assyrian people from the Black Sea region occurred. With the Persian Empire weakening, the Assyrians moved from Asia Minor and the southern shores of the Black Sea to the sea’s northern shores—to a land called Scythia. Here they began to be called Scythians, and their identity was eventually obscured. But these people didn’t just disappear into thin air. They migrated west and underwent a name change! To Greek and Roman authors, Scythia was the land beyond the civilized world. 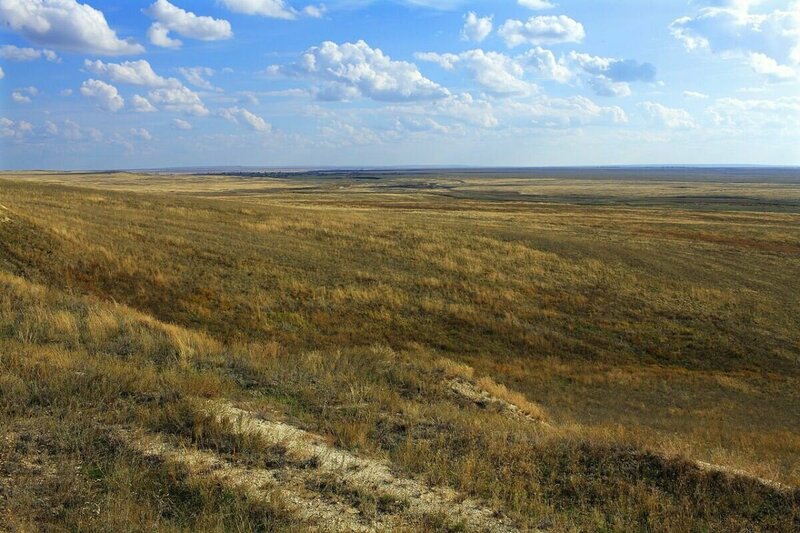 The land, consisting of mainly steppes, stretched eastward from Eastern Europe all the way past the Urals and from the Baltic Sea south to the Black Sea. All the many different people who lived in the territory were labeled Scythians. Predominant in Scythian territory were numerous tribes from two races in particular. “[T]wo major currently recognized racial types, Caucasoids and Mongoloids, are considered to have existed historically in geographical proximity on the steppe,” observes The Cambridge Ancient History (Volume iii, Part 2). Archaeology gives further insight into the area. “Archaeologically, it is clear that the eighth- and seventh-century b.c. ‘Scythians’ were not the same as the fifth-century ‘Scythians.’ Both were mounted elite war-bands originating in the more easterly regions of the steppe, and the Greeks, quite naturally, called both groups by the same name” (ibid.). The composition of Scythia’s population was open to much change over time as new tribes moved in and out of the area. Central Asia, with its vast steppes, has served as a gigantic crossroads for different nomadic people, some of whom, such as the Huns and Mongols, once established large empires stretching far into the east and west. Anciently, Scythia was the same way, a land where different tribes and races of nomadic warrior bands traveled. It is clear that the Germanic people comprised, at least in part, this second phase of Scythian migration. When Herodotus wrote his Histories, he would have had knowledge of the first two of those new settlements. The first phase would have been recent history for him—like the settlement of the Americas by the Europeans is today. The second phase was current—like the breakup of Yugoslavia is today, though it was right after his death that this second phase really began to flourish in Scythia, with most of the spectacular archaeological material dating to the later fifth century b.c. 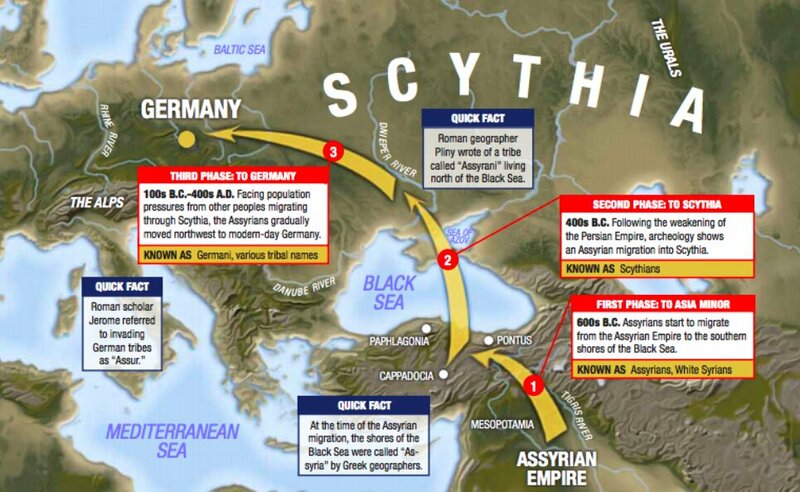 It is clear that the Germanic people comprised, at least in part, this second phase of Scythian migration. We can know this because Roman records show the Germanic people first began invading central and western Europe in the late second century b.c., soon after their northern move. Archaeology confirms these Scythians migrating all the way into Germany proper. “Nomads and fierce warriors, they lived in Central Asia … and their culture spread westward to southern Russia and Ukraine, and even into Germany …” wrote Mike Edwards in National Geographic (June 2003). This German migration would have been a result of the pressure that the newest migrants into Scythia, such as the Sarmatians, were placing on the Germanic people who occupied the territory. After the Sarmatians began to move in during the third century b.c., the Germanic people were forced further west. The dislocation of such a large population took time. Though the first tribes appeared in Roman records during the late second century b.c., it would take another several hundred years for the bulk of the Germanic people to finally reach the end of their long migration. Even in the first century a.d., with this migration still occurring, the Germans were feeling pressure from the Sarmatians. “All Germania is divided from Gaul, Raetia and Pannonia by the Rhine and Danube rivers; from the Sarmatians and the Dacians by shared fear and mountains,” wrote Tacitus, a Roman historian of the first century, in his history of the Germans, Germania. Archaeology and ancient histories provide the evidence, chronology and the catalyst for the German migration out of the Black Sea region—and subsequent invasion of the Roman Empire! During this migration, the Assyrians were lumped in with the other Scythian occupants. Then, when they arrived on the Roman scene, they acquired a new name. Roman historian Pliny the Elder, a contemporary of Strabo, explains what happened to the Assyrian people who migrated through this crossroads: “The name ‘Scythian’ has extended, in every direction, even to the Sarmatæ and the Germans; but this ancient appellation is now only given to those who dwell beyond those nations, and live unknown to nearly all the rest of the world” (The Natural History). Josephus, a first-century Jewish historian, wrote this of a Germanic tribe called the Alans: “[T]here was a nation of the Alans, which we have formerly mentioned somewhere as being Scythians and inhabiting at the Lake Meotis” (Josephus, 7.4). The Alans lived off Lake Meotis, which is the ancient name for the Sea of Azov that is linked by a narrow strait to the northeast of the Black Sea. Before German rationalism was introduced into academia and the biblical record was rejected, scholars knew exactly from where the Germanic people migrated. “[T]here can be no doubt that they … migrated into Europe from the Caucasus and the countries around the Black and Caspian seas” (A Classical Dictionary of Biography, Mythology and Geography,”Germania”). It may seem strange today to think of German people dwelling on the Black Sea coast, but even during Roman times, Germanic tribes occupied territory that extended far beyond the borders of modern-day Germany. Tacitus wrote of one such tribe, the Quadi, dwelling along the Danube River. Strabo described German people living farther southeast, with one Germanic tribe, the Bastarnians, as far east as the Dnieper River, a major river that drains into the Black Sea. From the Danube and the Black Sea, Germanic tribes once occupied land all the way north to the Baltic Sea and west to the Rhine River. So when the Germanic people were invading the Roman Empire, they were attacking not just from the north but from the east as well! Jerome, the writer who gave us the Vulgate translation of the Bible, was an eyewitness to these invasions in the mid-fourth century a.d. He writes: “Savage tribes in countless numbers have overrun all parts of Gaul. The whole country between the Alps and the Pyrenees, between the Rhine and the ocean, has been laid waste by hordes of Quadi, Vandals, Sarmatians, Alans, Gepids, Herules, Saxons, Burgundians, Allemanni and … even Pannonians” (Nicene and Post-Nicene Fathers, Jerome Letter 123, Section 16). Remarkably, in this same letter, Jerome wrote, “Assur also is joined with them.” Some say Jerome was using poetic license by quoting Psalm 83:8, but based on all the similarities of the people and the histories quoted that were available to scholars at the time, it becomes clear that Jerome was calling them actual Assyrians. Assur is another biblical name for Asshur, as any concordance will show. According to modern and ancient historians, these tribes listed—most of which were Germanic—came from the Black Sea region. The Cambridge Ancient History lists all of these tribes as attacking from the east, mainly from the Danube region. Thus, the history of the German people is made plain through the Roman and Greek writers. Without a doubt, the Germans are modern-day Assyrians! The Germans themselves say so in their ancient history. The Black Sea shores—the same area where the historians and scholars before the 1900s said the German people migrated from—are shown to have had Assyrians dwelling on both sides by Roman and Greek historians. It thus should not be surprising that those perpetrators of modern “bloodshed and slaughter” (penned just after World War ii) are themselves the descendants of the Assyrians. Finally, there is the overwhelmingly strong proof of prophecy. Only one nation today could fulfill the prophecies of the Bible that pertain to the Assyrians, and that is Germany! For more information, request our booklet The Holy Roman Empire in Prophecy. It will give you the eye-opening details of this final and most important proof of Assyria’s modern-day identity. You can also read about the prophetic progression for Germany’s future (and as it relates to Israel) here. Understanding the identity of the German people in prophecy opens up the grave meaning of whole swaths of inspired Scripture. Those prophecies were recorded in order to be understood in our day (Daniel 12:4, :9)—as a powerful warning from the great Creator God!